A method has been developed to continuously monitor and analyze variations in the local electromagnetic field with the use of a circuit that was originally developed for the detection of ELF (Extremely Low Frequency) radiation. These variations are also an expression of the fluctuations in the magnetic field of the earth and the ionization characteristics of the atmosphere. 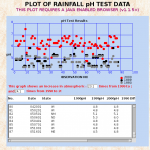 This page will describe the methods, techniques and tools used in the process; any assessment of collected data will be reserved for separate presentation. Photograph of prototype circuit being used in LF (Low Frequency) monitoring. Please refer to ELF Sensor by Steve Rouch for additional details and parts list. The circuit consists essentially of a large coil of relatively high inductance, which senses small variations in the surrounding electromagnetic environment. These signals are then highly amplified and the output signal can then be read in terms of volts. More useful data can be acquired if the output can be sent to a frequency meter or counter. It is of interest that the circuit shown was originally developed for paranormal research, and consequently any expectation of high level sensitivity to electromagnetic appears to have been met. Appreciation is extended to Mr. Steve Rouch for making information on this ELF sensor available to the public. The focus of the current research is to analyze the changes and variations of the output signal in correlation with the onset of the aerosol operations as well as their absence. In addition, control patterns of the ambient environment are to be established. The effects of geomagnetic and solar activity are also to be considered in the process. The circuit has been constructed according to the diagram, and no errors are known to exist. Due to some unanticipated findings and readings from the circuit, it will be valuable and helpful if other citizens or researchers will independently construct the circuit for testing in their local area. These abnormalities will be briefly described within this page and subsequently in greater detail in a separate paper. Unfortunately, little to no information on the actual use of the meter or experiences from testing has been provided within the original description. As a consequence, most findings presented here are a result of experimentation and trial and error. 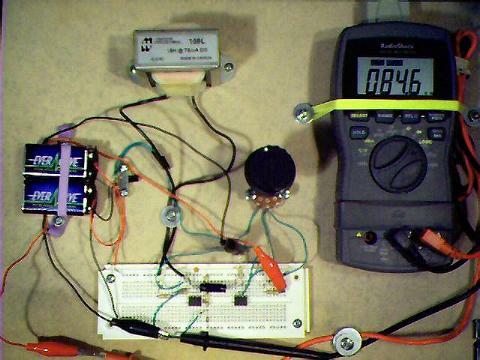 The output from the circuit has now been forwarded to a multimeter with frequency reading and data logging capability. Significant improvements in multimeters appear to have been made over the past few years, and a meter with the ability to log large amounts of data over extended periods of time is a valuable advantage in the current work. Such meters are now available for a very reasonable cost with respect to their performance, and can be acquired for less than $100. The cost of the parts for the LF (ELF) monitor is approximately $50. An older computer of modest specification is being used for data logging, and the full time use of that machine is required for this project. The data logging is set to an interval of one minute, i.e, one frequency data reading is taken every minute and logged to the file on the computer. Users will note vertical discontinuities on the graphs of data which are to be further presented on this website; these represent a manual recalibration of the circuit and are to be dismissed in any interpretation of magnitude. The focus of this data collection and analysis is upon VARIATIONS within the signal, not the magnitude of the signal. The magnitude of the signal being received is a secondary issue which will be discussed on a separate date. It is observed that some drift in the signal will occur over time and hence the need for occasional recalibration; drifting appears to be related to either voltage variations from the battery or from more unusual electromagnetic – geomagnetic – geophysical events and or various combinations of each. An example of data logging is shown below. 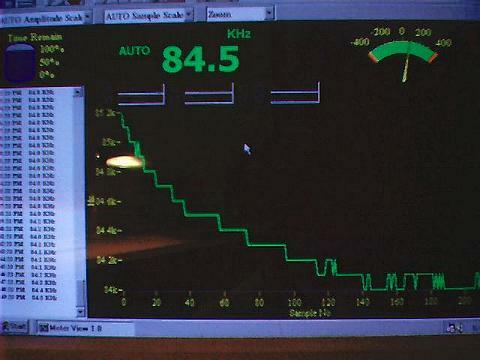 The current frequency reading on the meter example being logged is at 84.5KHz. This would be considered as the LF (Low Frequency) portion of the electromagnetic spectrum. It is a natural question to ask as to why this frequency range is being detected. It is an interesting question for which I currently have two suppositions which will be discussed in more detail later. For the time being, I will only stress that it will be beneficial if other researchers will construct the circuit for a means of comparison, and to help eliminate any possibility of circuit construction error on my end. It can be stated that the original purpose of the circuit was for ELF detection, but it can also be stated that the primary frequency now received is in the LF range. With respect to findings currently underway, this difference in the end may become irrelevant, but it will be helpful to address it with additional circuit constructions from other readers. It is know that the circuit can detect actual ambient LF – MF frequencies, as it has detected several local radio stations in the 500 – 1600 KHz range in the surrounding area when coupled to a frequency counter that features selective frequency ranges. The data logging frequency meter will latch onto only a single frequency, presumably the strongest (internally or externally generated, as will be discussed further later). Testing has also been conducted to operate the circuit in local areas that are electromagnetically pollution free as is possible, for control purposes. The influence of local radio stations in this and surrounding towns has also been evaluated, as well as the potential influence of navigational beacons. Research indicates that these factors can be adequately separated from the current investigations and findings. A sample of short term data logging and PC interface for the ELF-LF circuit. It has been found that the circuit performance is extremely sensitive to small changes in the variable resistor (potentiometer) of the circuit within a narrow segment of the range of that same potentiometer. This apparently is related to the changes in gain of the circuit and or resonance considerations. The actual use of the circuit is now being conducted within that narrow segment of the potentiometer’s range, which is best identified if pulse width information is available with the frequency meter being used. Additional technical details of this finding can be discussed with interested parties. If any errors in circuit construction on my end are ever identified with the aid of other participants, this will be helpful. If such errors exist, they may in the end represent a benefit to the project, as there does appear to be useful data under collection with the circuit as it has been built. The results of any data analysis will be discussed further as has been mentioned. Any questions, constructive comments or questions may be sent to me at cec101@usa.com. It is helpful, for the time being, to dismiss the origin of the 80-100KHz signal and to simply acknowledge it’s presence with the incarnation of the circuit that has been built. At the current point of discussion, it is most helpful to consider the LF frequency that is being received as a REFERENCE oscillating signal, which is then subject to detectable variations depending on the electromagnetic characteristics of the surrounding medium (atmosphere, earth’s magnetic field, local variations, etc.). It is these VARIATIONS in correlation with the aerosol operations that are the primary target of research here. My time and resources available for research are limited; it will be beneficial if numerous competent parties will begin to assist in the complexities of electromagnetic research (and other projects) that are now underway. There remains a continuous call for conscientious professionals across most scientific, legal and medical disciplines to openly and publicly participate in disclosing the consequences of the aerosol operations to the people of this nation and world. The political, media and journalistic vocations share equally in this responsibility. The progress of disclosure and the halt of the operations will remain hindered until this duty is fulfilled. We do not have the luxury of infinite time to ponder the extent and gravity of these operations; the results of four years of grassroots research and activism are available to you. Current and past findings underscore the sense of urgency on this matter. There is a need for your courage and for your service. Next Next post: A QUESTION OF ALFVEN?